Here is a brief excerpt from an article by Valeria Maltoni (“Conversation Strategist”) in which she provides much of a conversation between Steve Jobs and Bill Gates. She includes a video. To read the complete article, check out others, and sign up for a free subscription to Learning Habit Weekly, please click here. 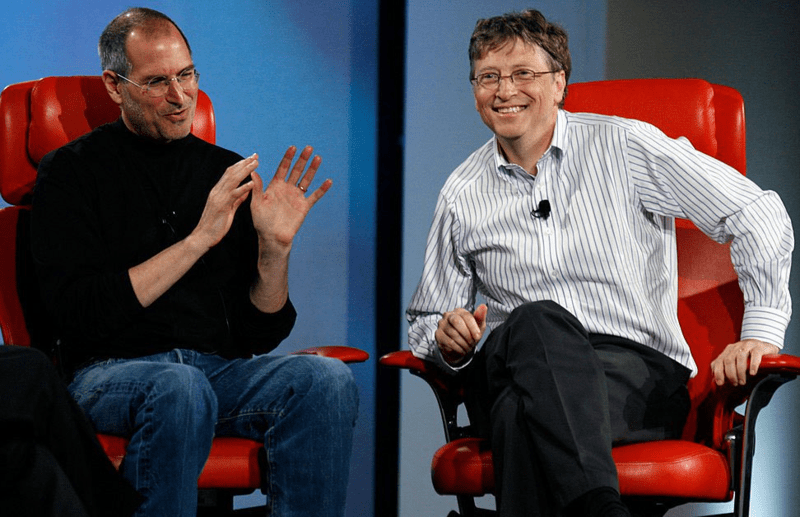 The video footage is from the D5 conference where Steve Jobs and Bill Gates shared the stage. Each gets to answer Walter Mossberg’s question about what major contribution the other made to the industry. At about minute 7.5, as Gates is getting deeper into engineering talk, Jobs says, “let me tell the story.” This alone shows how the two leaders’ lives converged over the years. The conversation is peppered with data points about the not too distant past — for example, Gates says Windows ’95 was the year graphics interface became mainstream. According to Gates it was a combination of things, software, hardware, etc. At minute 17 Jobs talks about how the people at Apple thought that for the company to win, Microsoft had to lose and how he felt that Apple had forgotten how to be Apple, because it didn’t have to be like Microsoft. At some point Jobs says Apple sees itself as a software company that mostly doesn’t compete with what Microsoft does and that they don’t believe they will reach an 80% share of the PC market. Here is a direct link to read the complete article, transcript, and video. Handpicked by Fast Company magazine for her particular expertise and ability to augment and amplify its brand footprint, Valeria Maltoni is the strategist a number of Fortune 500 businesses with multiple brands, revenue streams, and audiences rely on for brand value and profitable business growth. Leaders in industries as diverse as media and entertainment, consumer goods, beauty, fashion & style, wellness, publishing, and technology tap Maltoni for her strategic mind and hands-on approach. A future-oriented business resource, she drives the creative execution of integrated marketing and communication programs. To learn more about her, please click here.